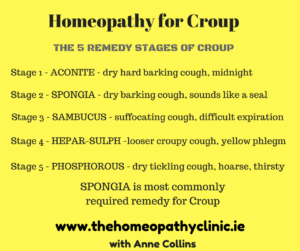 Treating Croup with Homeopathy ‘typically’ follows 5 remedy stages. There are other remedies but most of the time one of these will help. For general Cough remedies, see HERE. First stage. Comes on suddenly. Often around midnight. Dry, hard, barking cough. Constant. Irritating. May have high temperature. If croup has gone past the Aconite stage, it usually moves to Spongia. This is a great remedy for croup and most commonly used remedy. Dry, barking croupy cough – sounds like a seal barking. Typical croup sound. Attacks of coughing. This cough can be frightening for both child and adult to witness. Suffocating cough at night. Violent cough. Sweating. Difficulty breathing out. Croupy, choking cough. Rattling, loose chesty cough. Difficult to cough up phlegm. Coughs up thick, yellow phlegm. Feels very cold and wants to be covered. Irritable, critical and impatient with cough. Dry tickling cough. Cough worse from cold air, talking, laughing. Dry burning sensation in throat. Hoarseness. Lingering cough. Thirsty and want ice-cold drinks or ice-cream.